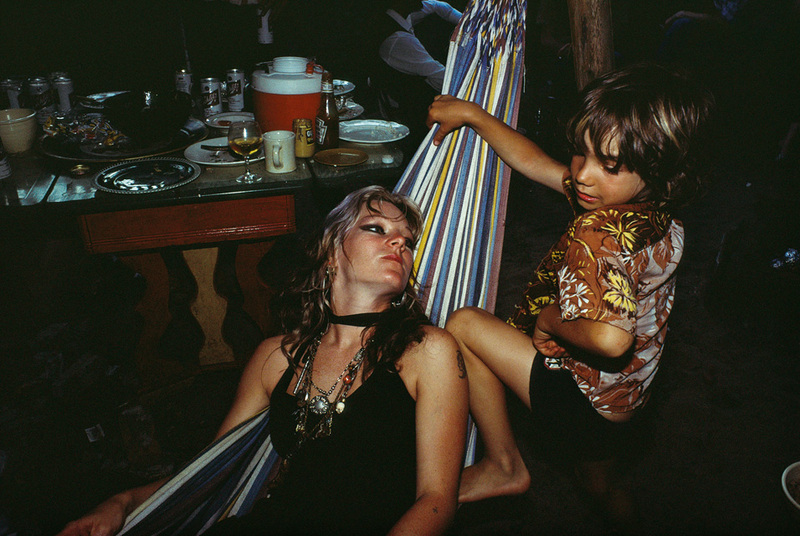 Nan Goldin, Cookie with Max on the hammock, Provincetown, Mass., 1977. Cibachrome, 30 x 40 inches. EAST HAMPTON, NY.- QF - Quattlebaum Foretich - Gallery presents Nan Goldin: wish you were here, the artistʼs first exhibition at the gallery from August 3-18, 2013. This intimate exhibition, curated by Carrie Mackin, includes color photographs from the 1980's to the present. Wish you were here, reveals the leisurely spirit of the artist's time at her home in Sag Harbor and her countless summers abroad. Nan Goldin, considered one of the most important photographers of her generation, is known for her intensely personal, sexual and confrontational imagery. Wish you were here includes a mix of new and iconic photographs of Goldinʼs friends, children and other loved ones reveling in the long, sunfilled summer days. Photographs ranging from Valerie floating in the sea, Mayreaux Island to IO in camouflage NYC will be on view, as well as rarely seen landscapes and portraits. Based on conversations between artist and curator, this exhibition is a visual diary of summers passed. Filled with personal experience and recollections, these selected works divulge as much about Goldin as they do about the subjects themselves. Nan Goldinʼs work has been exhibited in major retrospectives around the world, including the Whitney Museum of American Art, New York and Centre Pompidou, Paris. Her photographs and video are represented in major private and public collections globally. Goldin was admitted to the French Legion of Honor in 2006 and received the Hasselblad Foundation International Award in 2007. Her exhibition Scopophilia was part of Patrice Chéreau's special 2011 program at the Louvre. Most recently, she was awarded the 2012 Edward MacDowell medal. The artist was born in Washington, D.C. in 1953, currently lives and works in Paris, Berlin, and New York, and is represented by Matthew Marks Gallery. Carrie Mackin is an art and business consultant based in New York City. She has recently joined Hilton Moore Partners as the Director of Fine Art, a private fund investing in contemporary art, rare books and wine. During the summer months she spends her time in East Hampton as Director of Special Projects for QF Gallery. Mackin has produced projects for the most innovative artists of her day including Mickalene Thomas, Wangechi Mutu, E.V. Day, Hank Willis Thomas and Josephine Meckseper among others. QF Gallery is in its second year as a curatorial project space in East Hampton, featuring emerging and established artists and curators. The gallery is in the bottom fourth of a traditional East Hampton home that was built in 1905.